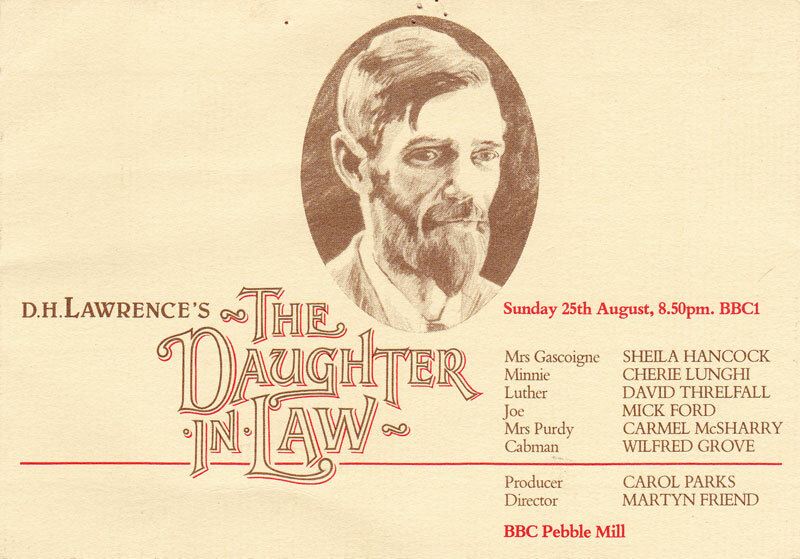 ‘The Daughter-in-Law’ was an adaptation of D.H.Lawrence’s play about the 1912 coal strike. It was produced at Pebble Mill in Studio A and transmitted in 1985. It was directed by Martyn Friend and produced by Carol Parks. Dave Bushell who has kept this TX card since 1985 was the director of lighting. Michael Edwards was the designer and Ian Rae sound supervisor. 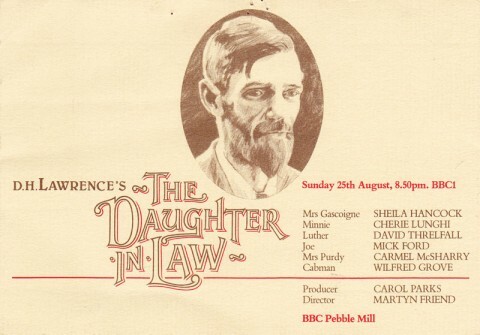 It was a star studded cast including Sheila Hancock, Cherie Lunghi, David Threlfall, Mick Ford, Carmel McSharry and Wilfred Grove. Gareth Williams, adds the following comment: ‘I was the floor assistant on this show. It was recorded over four days in Studio A in story order. This meant that however much or little attention they paid in the preparation period, every single member of the crew got to see the story unfold before their very eyes, played out by a fantastic cast. I was the floor assistant on this show. It was recorded over four days in studio A in story order. This meant that however much or little attention they had paid in the prep period, every single member of the crew got to see the story unfold before their very eyes played out by a fantastic cast. The final scene between David Threlfall and Cheri Lunghi (The Daughter in Law) after Carmel McSharry’s character had died left the whole studio moist eyed – and then Martyn Friend asked for another take and we all cried again!